I took a two day trip from Calgary to Nordegg with my friend and 'Aces' photographer, Keith Walker. Mountain shots taken on the Banff Jasper Highway from Lake Louise to Saskatchewan Crossing. Some of the pictures, taken with my relatively new 200-400 Nikon Lens brought the details of the snow to a new level for me. What a great trip! Close up, it is easy to tell a Raven from a crow. The large bill is most telling. 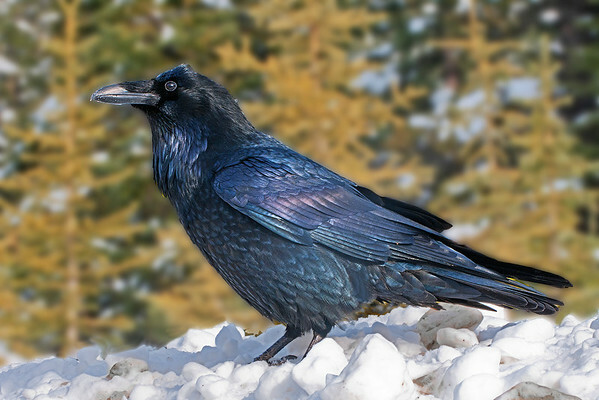 A raven vocalizes with a raspy croak vs a crow's caw. Often the feathers are quite shaggy around the throat.